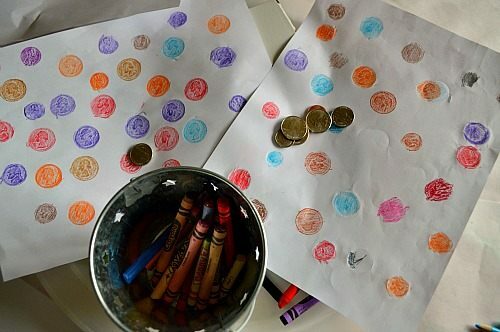 With a few coins and colored pencils create this fun art-math combo activity. What I really like and I’m sure other busy moms would appreciate is that it is set-up free and mess-free. Let’s be honest we want it all, right? An engaging, fun and if possible educational kids activity which has NO elaborate set up and mess free. This art and math activity fits the bill! It is unique and my kid loved seeing the impressions on the paper. I provided my preschooler with a few coins, sheets of white paper and crayons and colored pencils. I had her lay out a few coins on a sheet and cover them with another sheet of white paper. 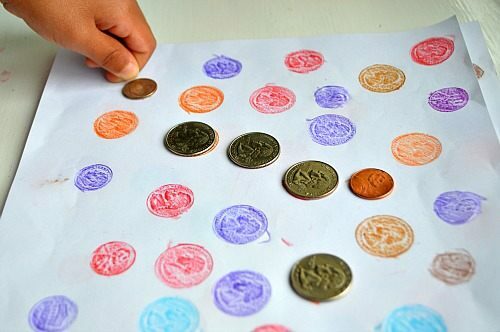 Then she made coin impressions by coloring over the coins. I should mention that we started off using crayons for rubbings but soon found out that colored pencils worked much better. The reason : kids find it hard to NOT push hard while coloring. Gentle shading is difficult to practice. 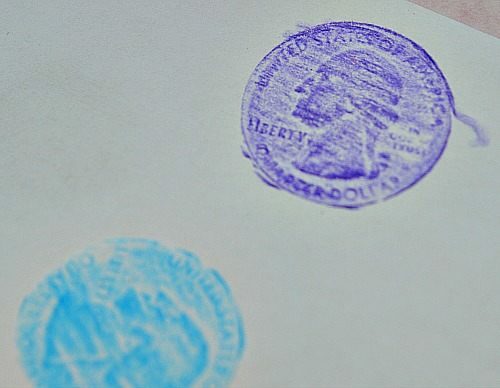 That’s why colored pencils were a perfect solutions since the pressure did not affect the coin impression. These are the beautiful coin impressions my kid and I made. I sat down and made one with her with the intention of turning it into a matching game. I set out my coin rubbings paper and a few coins for her. She set out matching the impressions to the coins. A few of them were challenging but her focus was amazing. Unique and out of the usual workbook activities really get prechoolers to focus and we all know focusing on one activity for a long duration is not something many preschoolers can do. More ideas to make coin rubbings fun! 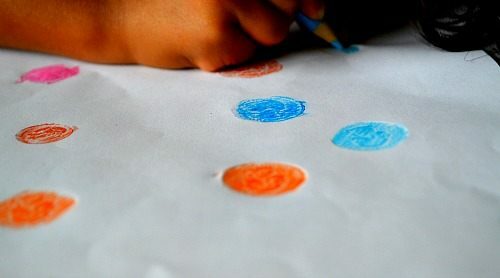 You could lay out a few coins on the paper, cover it up with another sheet and have the kids crayon rub. 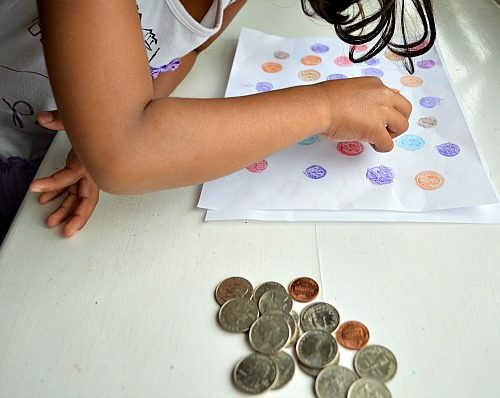 In this game the child does not know what coins are under the paper. He/she guess as and when she rubs and creates a new coin impression. Create a pattern ( flower or a shape) and the child can rub and create designs. How fun? If you end up using crayons, wash over the paper with water colors to have the crayon colors pop out. 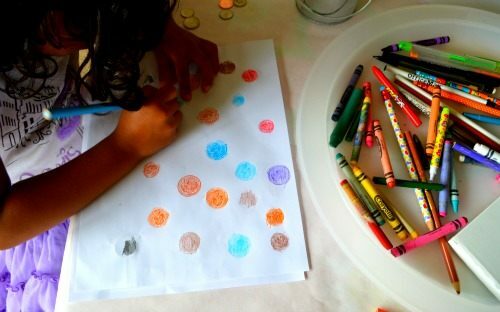 An adult could do the coin rubbings with a white crayon and create a “secret” money activity sheet. 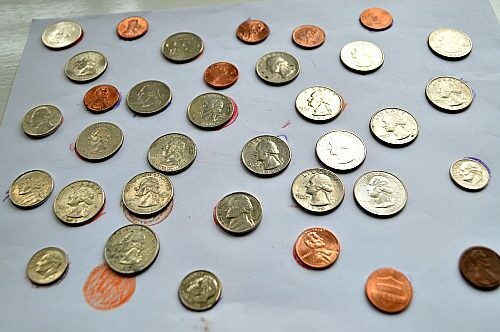 The kid can use water colors to reveal the coins. 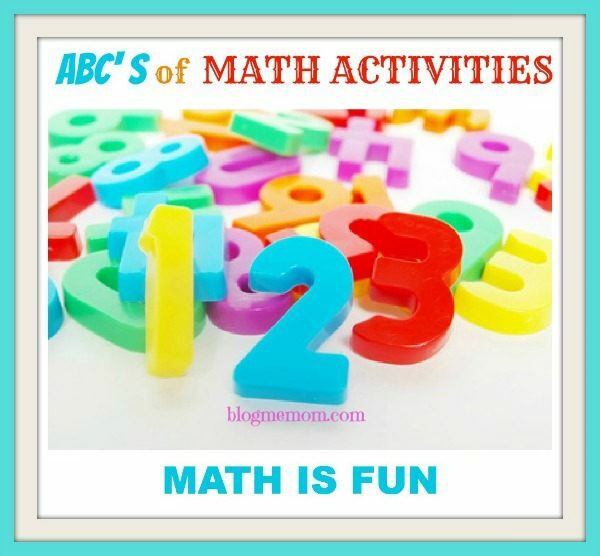 For more math activities visit our category page.